The Saudi decision to execute Shiite cleric Sheikh Nimr al-Nimr at this particular juncture was a strategic act of defiance meant to challenge Iran and the United States in particular. The Saudis wanted to send a blatant and carefully calculated message that the Kingdom is capable of standing on its own, and it will not be deterred by either the already destabilized region or by the repercussions of its act. Saudi Arabia supported Saddam Hussein during the Iran-Iraq war (from 1980-1988) that claimed over one million causalities between the two sides and only deepened the hostilities between Saudi Arabia and Iran. The 2003 Iraq War brought a revolutionary shift that ended the decades-long US policy of mutual containment of the two countries and allowed Iran to become the dominant player in Iraq. The subsequent bloodshed between Sunnis and Shiites in Iraq, with Iran’s direct support of its Shiite brethren, destroyed any remnant of diplomatic normalcy between Saudi Arabia and Iran. Following the eruption of the Arab Spring, the civil war in Syria brought both sides into open confrontation as Syria became the proxy war between Saudi Arabia and Iran. Finally, Iran’s ambition to acquire nuclear weapons fueled the Saudis’ legitimate concerns that a nuclear-armed Iran will make it the de facto regional hegemon; in that case, Iran would have the ability to intimidate its neighbors and impose its own political agenda throughout the Gulf. As a country that has primarily relied on the US for protection, with which it has developed close and binding relations, Saudi Arabia felt all along that it could count on the US to prevent Iran from acquiring nuclear weapons. Although the US has made every effort, including the imposition of crippling sanctions, to prevent Iran from realizing its nuclear ambition, the Saudis felt betrayed by the secret nuclear negotiations between the US and Iran. In addition, Riyadh viewed the Iran deal as a bad deal for having multiple loopholes, which the Saudis believe Iran will exploit since it is determined to acquire nuclear weapons at any cost. The Saudis became gradually convinced that the Obama administration is tilting increasingly in support of Iran for a number of reasons: a) President Obama does not want to jeopardize the Iran deal, on which much of his legacy hangs; b) the administration concluded that without Iran’s participation in the peace talks there will be no diplomatic solution to end Syria’s civil war; c) the US views the Iran deal as stabilizing and thus it gives relations with Iran priority in the current diplomatic tussle between Iran and Saudi Arabia; and d) the US’ failure to impose sanctions on Iran for testing ballistic missiles has deeply irked the Saudis, who decided to take matters into their hands. Knowing full well what the repercussions of executing Sheikh al-Nimr would be, Saudi Arabia went ahead with its plans because the potential gains, from the Saudi perspective, far outweighed the prospective fallout. To demonstrate its resolve, Saudi Arabia carried out the execution of the cleric deliberately at a time when regional rivalry between Sunnis and Shiites is at its peak. The execution was also carried out to appease the Sunni Saudi clerics who are concerned about Iran’s growing regional influence, and at the same time deter sympathizers of ISIS, which regards Saudi Arabia as an enemy. Moreover, Saudi Arabia intended to exclude Iran from playing an active role in the search for a solution to Syria’s civil war while impeding the growing alliance between Moscow and Tehran to control the predominantly Sunni Syria. Similarly, as Saudi Arabia is fighting a proxy war against Iran in Syria, Iraq, and Yemen, it is determined not to allow Iran free regional reign. By creating the crisis, Saudi Arabia also hopes to disrupt the warming relations between Iran and the US, which it views as contrary to its interests. In addition, Saudi Arabia hopes to undermine the EU’s drive for rapprochement with Iran, as it otherwise has the potential of becoming the largest trading partner with the EU. 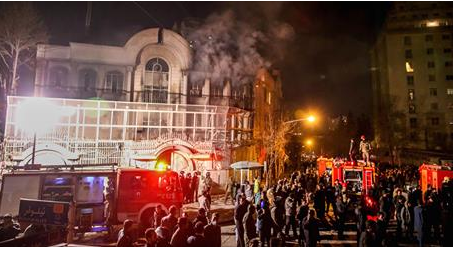 The ransacking of the Saudi embassy in Tehran was seen by the Saudis as a ‘blessing in disguise,’ playing into the Saudis’ hands and putting Iran’s President Rouhani on the defensive, prompting Iran to condemn the act. This has boosted the Saudi position and potentially changed the conflict dynamic between the two countries. First, the US should seek to postpone the convening of the January 25 international conference in Geneva that seeks a diplomatic solution to Syria’s civil war, in order to give Saudi Arabia and Iran a calming period as the participation of both countries is central to finding any lasting political solution in Syria. Second, the US should impose new sanctions against Iran for testing intercontinental ballistic missiles in violation of UNSC Resolution 1929. This measure is particularly important not only to appease Saudi Arabia, but also to send a clear message to Tehran that it cannot violate international agreements with impunity. Third, it would be wise for Secretary of State John Kerry to travel to Riyadh, even for only symbolic reasons, and reiterate the US’ commitment to Saudi national security. In addition, his visit would allay the Gulf states’ concerns that the US is being more critical of Saudi Arabia than Iran, a perception that could further reduce US influence, especially in Riyadh when it is needed the most. Fourth, although the US is focusing on deescalating rather than mediating the Saudi-Iran crisis, it has no choice at this juncture but to play a more active role with the objective of resuming the Geneva talks at a later date to end the tragic civil war in Syria. The manner in which the US has conducted itself in connection with the Iran deal, its unwillingness to project itself more aggressively in Syria, its lack of support (as perceived by the Saudis) of the Saudi role in the conflict in Yemen, and its reaction to the current crisis, gave rise to the Saudis’ deep concerns about Washington’s ultimate goal in the region, especially now that the US no longer depends on the Gulf’s oil. Although the US should continue to seek good relations with Iran, it must now conduct a balancing act to allay the concerns of its Arab allies in the Gulf while showing some toughness in relation to Iran, which in fact is needed to preserve the Iran deal and prevent another regional crisis.